The Enterprise comes across a duplicate Captain Picard from six hours in the future, who apparently abandoned his ship moments before it exploded, killing the rest of the crew. Riker says he's making omelets, but those eggs are definitely scrambled. Picard acts like this is the first time he's come face-to-face with himself because of time travel, but it's not. It happened before in the episode "We'll Always Have Paris." The "opposites" motif--like the stimulants having a depressant effect on future Picard--is totally unnecessary and non-sensical. It's weirdness for weirdness' sake. "There is the theory of the Mobius, a twist in the fabric of space where time becomes a loop." Thank you, Orbital, for immortalizing this line. The decision to continue on course makes absolutely no sense. If it were established that the future is inescapable and that paradox is impossible, then perhaps the logic of not second-guessing themselves would be proper. However, in previous Star Trek episodes dealing with time travel, including TNG's "We'll Always Have Paris," it is established that the future is alterable. Either way, the only logical course of action is to not continue as though everything were normal. If time is immutable, the future will still happen, so trying to change it will do no harm. However, if it can be changed, it will be if you proceed along a different path. That means that, assuming the maleability of the future is a 50/50 proposition, Picard's two options are (1) don't try to change anything, which has a 100% theoretical probability of leading to the destruction of the Enterprise, or (2) do everything you can to change the future, which has a theoretical probability of imminent destruction of only 50%. I know some people think this time travel stuff is complicated, but if you ask me, it's a no-brainer. The only logical decision in this case is to turn around. By the time Picard finally figures this out, it's too late. I don't like Picard's anger and attitude towards his future self. It's disturbing, and it doesn't fit his character, no matter how much Troi tries to explain it. Picard is rational, but this makes him seem totally irrational. I also don't like the idea that future Picard's mind is broken until he "catches up" to his present. For one thing, he's still aging as time goes by, so if being out of phase is a problem, he'd never improve because he'd always be stuck six hours in his past. For another thing, it's an obvious plot convenience, putting a Picard duplicate on the ship but not letting him be a source of information. The episode would have been much more interesting had future Picard been totally coherent and rational, because then there'd be all kinds of interesting complications. Whoever wrote this one needed to learn a lesson: sometimes, embracing plot complications makes your story much better than trying to force the story around them. Clarke was the master of this. Why is Picard being attacked by a spatial anomaly again? Oh right, because it is convenient for the plot. 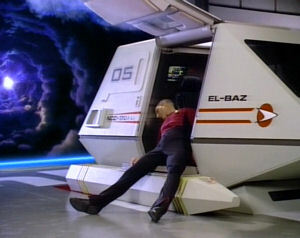 Picard leaves the Bridge in a hurry to get to Sick Bay. When he leaves the Bridge, Troi is there, but when he gets to Sick Bay, Troi is there. Did she do a site-to-site transport for no reason, or did Picard make a pit stop along the way? Bet you never thought you'd see Captain Picard kill himself on this show. O'Brien must be thinking, "Wait, which Picard is dead?" This episode would have been much cooler if future Picard had killed present Picard to end the cycle. They don't even bother leaving a warning beacon behind. I usually love episodes dealing with time travel, but this episode is the exception. The writing is just too sloppy and the plot is really convenient, as though they were making it up as they went along and forcing events to match the random stuff they put in the beginning. In short, this episode is horribly under-written. It needed a lot more time in the planning and rewriting stages, which is ironic since the previous episode, "The Royale," had the opposite problem. As I spend a lot of time thinking about the narrative possibilities of time travel (see Paradox), I take this episode as a personal insult to my intelligence. Riker's view on cooking is very similar to Sisko's, but I bet you Sisko would know what to do with those exotic eggs. It always bothers me that it takes the characters in Star Trek so long to accept that time travel is possible, given the many times it happens in the shows (and movies). Since time travel is a major part of the mythology of Star Trek ENT, which in the Trek universe happened long before even Captain Kirk, you'd think the Federation would have accepted it by at least Picard's time. Heck, you'd think they'd have come to terms with it when Captain Kirk brought humpback whales back from the past in order to save the Federation in Star Trek IV. This episode is like a primitive version of "Cause and Effect," a much more polished story dealing with a lot of the same ideas.